There is no evidence that Seattle’s founders first named the city Duwamps. If it was named Duwamps though, Arthur Denny was responsible. Let’s fix the story of Seattle’s first name. I’m not talking about Alki. West Seattle’s Alki Point got its name from the original settlement, the one prior to Seattle, on that flat point jutting into Puget Sound. It was called New York Alki (New York before long). 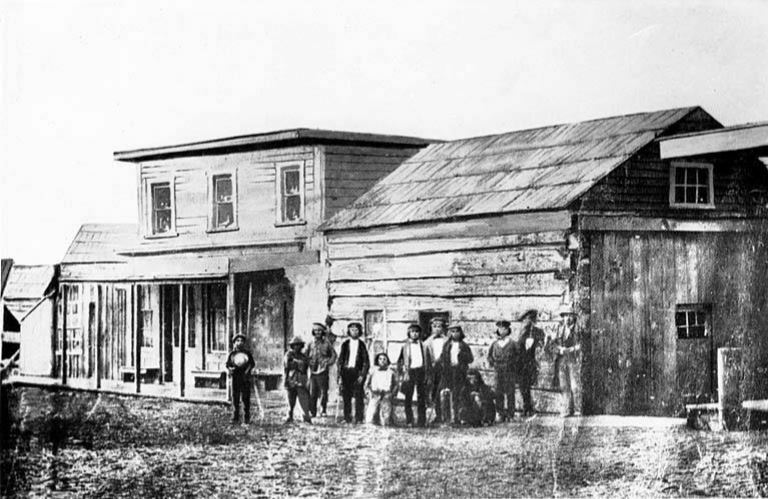 Arthur Denny and his group landed at Alki November 13, 1851. Instead, I mean the first name of the second settlement. Some of the group gave up on New York Alki after just a few weeks. They checked out nearby bays and then looked carefully throughout Elliott Bay, finally choosing a good spot for a town in February 1852 on the southern part of the east shore near the boundary where sea salt gives way to fresh river water. I’m talking about Dewampsh, which we’re now told was Seattle’s first name. Seattle pioneer Arthur Denny told us in his 1888 book Pioneer Days on Puget Sound that native Lushootseed names were mispronounced and written in a misleading way. What sounded like “Dewampsh” was written Dewamps, and then Duwamps and finally Duwamish. 1855 land survey field notes spell it yet other ways: Dwamish or Duwammish.. The Washington Historical Quarterly also related that by 1918 the word was being written Dwamish, although that corruption has now disappeared again. Created on January 12, 1852, Oregon Territory’s Thurston County included all of the Olympic Peninsula and Puget Sound and further east to the Cascades. Elected in June 1852, all of the officers and two of three commissioners of Thurston County lived in the village of Olympia. Arthur Denny was the only non-Olympian. He lived at New York Alki at the time Thurston County was formed. But in January he was already looking for a good shipping harbor with fellow settlers William Bell and Carson Boren. The Denny group decided on the spot we call Pioneer Square on February 15, 1852. It was a good place to land and walk east to now-Lake Washington, so the Duwamish called it “Little Crossing-Over Place”, written sdZéédZul7aleecH by Coll Thrush in Native Seattle and Tsehalalitch or Zechalalitch in older texts. It had been a native village and one building remained. In April 1852, Boren, Bell and newcomer David Maynard moved from Alki to the new settlement. Arthur Denny, recovering from illness, moved over a bit after them on June 12, 1852. On July 6, 1852 the Thurston County Commissioners voted on boundaries and names for voting precincts. One precinct was named Dewamps which included land from the Canadian border south to the Puyallup River, and from the shore to the Cascades; and a piece of the peninsula from the Puyallup River to Hood Canal. As the only commissioner from this area, Arthur Denny must be the one who named it Dewamps. Denny and Olympian David Shelton were the two commissioners that voted to create the precincts. It’s odd that you can easily find mention of Arthur Denny as a Thurston County Commissioner, and easily find mention that the Thurston County Commissioners put the name Dewamps on our precinct, but I haven’t yet found a reference attributing the name to Arthur Denny. The seat of Dewamps precinct was Denny’s settlement. Mail was delivered there, voting took place there, court cases were heard there. Of the four other precincts, three were named after villages (Olympia, Steilacoom, and Port Townsend) and one was the name of a tribe and set of geographical features (“Scadget”, or Skagit). I believe that the Dewamps name was similar to Skagit, not the name of a town like Olympia. The official date of Seattle’s start is remembered as May 23, 1853: when Denny, Boren, and Maynard filed their town plan under the name Seattle. The name Seattle first appeared in print on October 30, 1852. 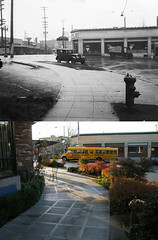 Twice it was used in The Columbian, in ads for Henry Yesler’s mill and Maynard’s store “Seattle Exchange”. Maynard arrived on March 31 with Chief Sealth to catch and pack fish, and Maynard took a claim amidst Boren and Denny. Maynard is credited with naming the town, convincing the others to name the settlement after his friend Chief Sealth. So the name was coined sometime between April and October. Put briefly, the settlement started in April 1852 at a place called Tsehalalitch, and probably went by that name if any. 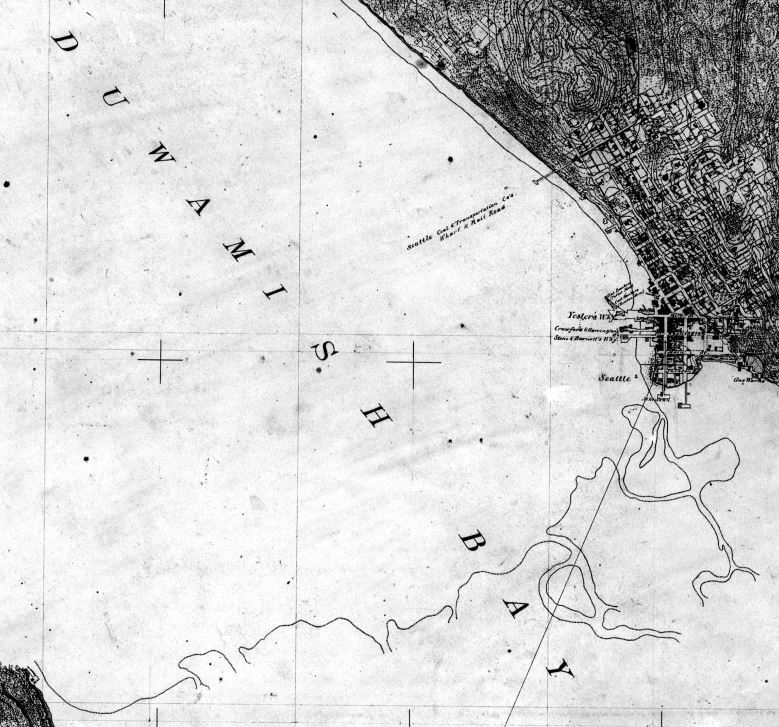 The Duwamps precinct was created and named by Arthur Denny in July, referring to a broad region on the east side of Puget Sound as well as specific geographic features such as Lake Washington, the White River (now Green River), Duwamish River, and Elliott Bay. And then the name Seattle for the settlement was decided in late summer, sometime before mid-October. There is a pervasive myth that Seattle, long before it was a city or even a village, was named Duwamps. Historians for almost a century have accepted the Duwamps origin myth, and they’ve each incorporated their own jokes about the name into their retelling as well as into the shared civic brand. Sources for the article are Clarence Bagley’s 1916 History of Seattle, his 1929 History of King County, and Murray Morgan’s 1951 Skid Road. The first version known to me of the story of Seattle and Duwamps was written by historian Thomas Prosch. It was in his wordily-titled 1906 dual biography of Seattle poineer Doc Maynard and his wife Catherine (David S. Maynard and Catherine T. Maynard: Biographies of Two of the Oregon Immigrants of 1850). Prosch definitely had a source, but I’m unclear whether it was the Maynards or another history. “When the people first came to Seattle they found it possessed of a number of names. Parts of the land are said to have borne the Indian names Mukmukum and Tsehalalitch. The bay was called Elliott by Capt. Chas. Wilkes in 1841. Later Capt. James Alden called it Duwamish; the river, Duwamish; the point of land opposite, Duwamish Head; and the lake to the east, Duwamish lake. “The authorities of Thurston County called the first election precinct Dewamps, or Duwamish. Prosch, David S. Maynard and Catherine T. Maynard, page 36. Two things stand out to me. First, Prosch did not actually say that proto-Seattle was called Dewamps. He said that there were many names to choose from, and in the end none of the geographical names were chosen. The other thing is that Prosch indefensibly indicated that Dewamps was an externally applied name. He ignored the fact that “the authorities of Thurston county” were three in number, and one of them was Arthur Denny. Prosch’s description of Seattle’s settlers as victims of poor naming is believed to this day, regularly included since the early histories of Seattle. Surely Denny named Dewamps, and he did it as a founder and resident, not as a nameless bureaucrat. So Prosch in 1906 said that the Denny, Bell, and Boren settlement had no name until Maynard came in 1852. Then in late summer 1852 they all chose the name Seattle. Clarence Bagley in volume one of his 1916 History Seattle rewrote Prosch’s story of the name. Bagley’s account is important because he and Morgan are the only two citations for HistoryLink. “There seems to be no record of the exact time that the name Seattle was chosen by the founders for the new town. However, it had become well known by that name as early as the fall of 1852. The first few settlers realized the importance of selecting a name that would reflect credit on the metropolis they hoped someday to build and various suggestions were made. It was found that some of the land upon which the city now stands already was known by name, the Indian words Mukinkum and Tsehalalitch having been applied to some of it. Bagley, History of Seattle, page 32. So Bagley recounts Prosch’s version of events with only a slight rewording. He says the settlement was called Seattle by the fall of 1852, but makes no claim about what it was called prior. The name Dewamps was available, and applied to the region, but he doesn’t say it was used for the few cabins on the east shore of Elliott Bay. Bagley’s account does not support HistoryLink’s claim that Seattle was named Duwamps, so the source must have been Murray Morgan’s 1951 book Skid Road. The popular history of the name was modified sometime after 1916 and before Morgan in 1951. Infant Seattle Named Dewamps, Seattle Times, June 11, 1939, page 1. Notably, McDonald’s story is the first time that I see the name written Duwamps instead of Dewamps. I think it’s likely that he or Conover was Murray Morgan’s source. Later in 1950, C. T. Conover returned to the topic again in a July 6 article based on the 1943 book Chief Seattle by Eva Greenslit. This time the story used made-up quotes from Denny and Maynard. Greenslit’s book was written with imagined dialog of the participants in Seattle’s founding. C. T. Conover, Seattle Christening for Old Indian Chief is Recalled, Seattle Times, July 6, 1950, page 34. Surprisingly this made-up dialog is in some ways the most accurate version so far. Dewampsh was definitely a regional name. The book makes the point that it could have referred to the name of the settlement on the river, at later Georgetown (Maple and Van Asselt families), just as easily as the settlement on the bay. Murray Morgan, Skid Road: an Informal Portraits of Seattle, page 28. This is not a new concoction. Murray and Rosa Morgan here retell the story as we’ve heard it before. They didn’t notice the flaws in the story that was handed to them, but neither have historians in the seven decades since. Dewampsh was not named by a bureaucrat, contrary to the implication. Olympia was a village. Yes, there was a citizen who held the role of county clerk named Daniel Bigelow. But it was perhaps the least of the roles he served as a county citizen: he was a lawyer and elected as the county treasurer. Indeed Thurston County had no money for full time government employees. Also it’s worth noting that Bigelow traveled to Puget Sound on the schooner Exact, on the same trip as Arthur Denny and his group. Perhaps Bigelow was the most well known to Denny of the small group of Thurston County officials. Even if Bigelow were the originator of the name Dewampsh, it would not have been without Denny’s input. There is no contemporary evidence described here, or that I’ve found, which provides a name for Seattle prior to the fall of 1852. Morgan correctly states that the colony was, as far as we know, initially nameless . In my view it is better to say that the colony was built on one of the rare spots that already had a native name. Be cause of that, I propose that they must have used that when talking with Duwamish and other native people in the area. There is a letter addressed to Denny or Maynard in the MOHAI archives addressed to Dewamps, Thurston County, Oregon, but there is stronger evidence that referred to the precinct than to the settlement. Dewampsh was already an administrative name that they could have chosen. No town had claimed it yet. Indeed, none ever would! They instead chose to name the town after Chief Sealth, who lived with them through their first spring and summer. I’ll repeat myself to leave a clear version of the story. Not-yet-Seattle started in April 1852 at the spot we call Pioneer Square. Denny, Boren, Bell, and Maynard called it Tsehalalitch when they talked to the native people, like Chief Sealth, who lived with them and those who visited throughout the spring and summer. The Dewampsh precinct was created and named by Arthur Denny in July, referring to a broad voting precinct on the east side of Puget Sound to the top of the Cascades. Previously it was used for specific geographic features such as Lake Washington, the White (now Green) River, Duwamish River, and Elliott Bay. The name Seattle for the settlement was decided sometime before mid-October 1852.